Take a wild guess how this one got it's name. Let's just say that it has lots of air time. 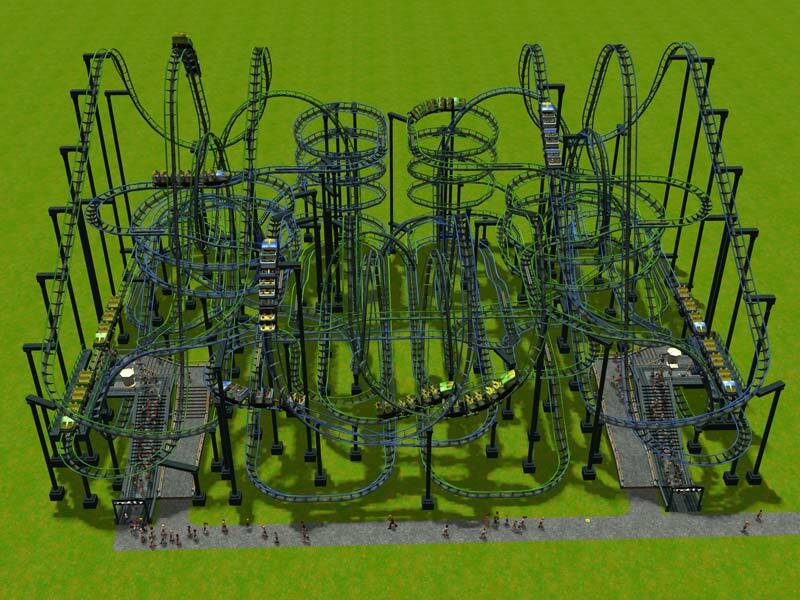 This coaster requires the patched version of RCT3. It won't work with the original unpatched retail version of the game. This one is lots of fun to ride using the CoasterCam. You can download Ups And Downs from here. This one may not look particularly interesting but, trust me, it's got a "special feature". I designed it for a park called "The Gulag". I haven't gotten much done on The Gulag but this one is a great start. 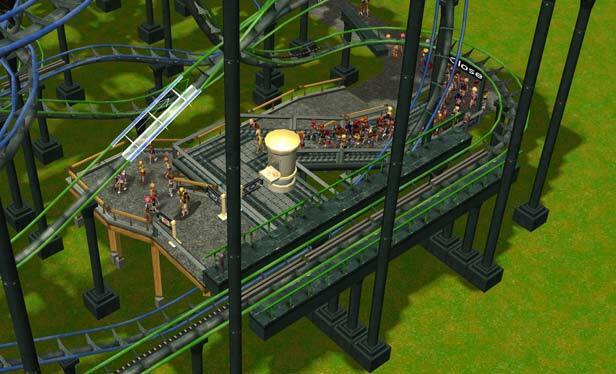 This coaster requires the patched version of RCT3. It won't work with the original unpatched retail version of the game. You can download Darth Corkscrew from here. This coaster is an extremely tightly packed ride with two mirror-imaged sides. 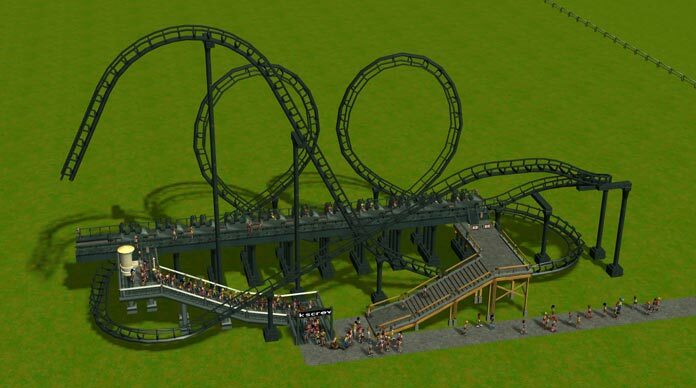 This coaster requires the patched version of RCT3. It won't work with the original unpatched retail version of the game. This one is lots of fun to ride using the CoasterCam especially if you enjoy the feeling of things rushing past your head. You can download the two halves of Extremely Knotty from here and here. There's a bit of a trick to connecting up the exit path as shown in the top image above. You'll have to temporarily remove the piece of track shown above in white, put in the exit path, and then replace the missing piece of track. 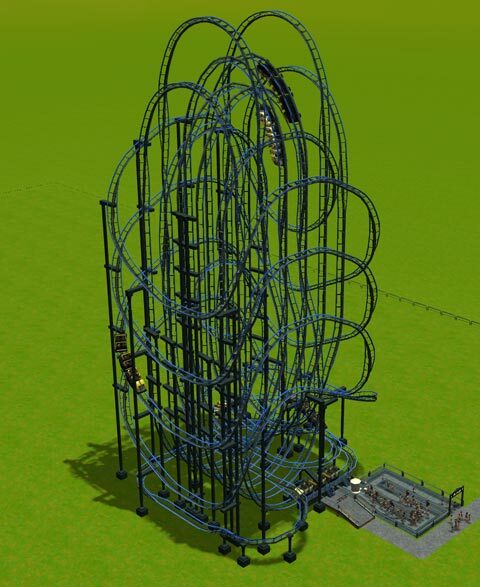 It doesn't look like a collision to me but the coaster editor seems to think so. But if you put in the exit path and then the last piece of track then it accepts it just fine. You can also put the exit path on the opposite side of the station but I like it better on the inside.